In life, you tend to be a bit of a wallflower. You love to blend in, go unnoticed, and observe a party from afar. And there is nothing wrong with that! 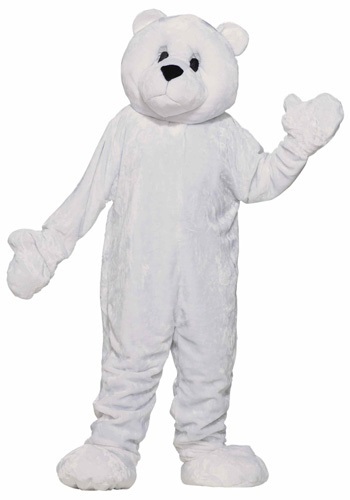 Unfortunately...you are also incredibly (and understandably) drawn to this adorable Mascot Polar Bear Costume. The issue? This festive, furry friend is liable to make you a stand out wherever you go! What a predicament. Although, not really, if you really take the time to think about it. This costume will keep you covered (not to mention super cozy) from its furry ears to its plush white toes...so no one will know your true identity...unless you decide to reveal it to them! In fact, you may even want to take this rare moment tonight to experiment with being the center of attention, risk free! You can prowl the dance floor all evening and tomorrow you can go back to hibernating in your den by yourself--so this outfit sounds like a win-win to us! Of course, if you are headed to a party along a billowy snow bank, inside a snow cave, or atop an iceberg then this costume will keep you in comfort zone: blending right in. But barring those unusual circumstances, we are fairly certain that this cuddly jumpsuit may be just what you--wallflower--really need to help you find your inner growl. Talk about a claws for celebration! Good costume, for Halloween. But I got hot with the head on, and couldn't see the Trick Or Treaters' bags very well. The zipper is hard to move up, or down, when I have it on. So, I had to just move the zipper down a little ways, and then nearly struggle, to take it off. I may have even been an inspiration to one Trick Or Treater, for next Halloween. I'd be willing to wear it, any time,for hire. Bought it last year. This is a well made costume. the only problem is that it is too well insulated. I almost passed out due to the heat while wearing it inside. It would probably be great outside on a cool day--but not inside. It came 3 days early. It fits, except maybe at my feet. I think I'll keep it, or at least try it on, one more time, to be sure it really fits. It's hard to step into but comfortable. But why is the tail on the front? Isn't' that were the zipper is supposed to be? Second costume, I ever ordered on line. But the first one that, I was actually happy about. It's like a robe. it's that warm! Wish I could order a Wolf mascot costume and an Easter Bunny costume, next. A cat one, too. But back to the bear. Which foot is which? I think, I'm going to enjoy wearing this costume! Sure wish the description said where the zipper is supposed to be. Thank you for the feedback! I believe that the zipper and the tail will be on the back of this jumpsuit so that should help with getting in and out of the item. The foot covers should be able to be worn on either the right or the left foot so hopefully that helps as well. If you have further questions, don't hesitate to reach out to Customer Service!